Drain and chop Artichoke hearts, mild green chilies and pimentos. Combine above ingredients in a large bowl. Add salsa to taste, add mayonnaise and sour cream. 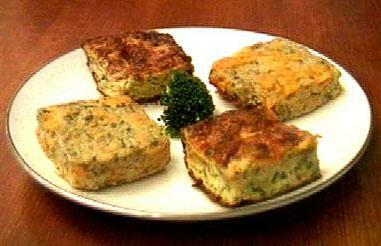 Place in a small casserole dish or quiche dish. Top with grated cheese and microwave covered 4 to 6 minutes until bubbly. Garnish with sour cream, cilantro and olives. Serve with tortilla strips and crudités or fill cooked artichokes with hot dip. Drain half of the liquid from one jar of artichoke hearts into a frying pan. Drain the rest of liquid from both jars of artichoke hearts into a strainer and discard drained liquid. Add onions and garlic to liquid in frying pan and sauté for 5 min. Place eggs in a bowl and beat with a fork. Add crumbs and seasonings. Add drained and chopped artichokes, cheese and frying pan ingredients. Place into a greased 7x11 inch pan and bake at 325° about 30 minutes. Cool in pan and cut into squares. Nana's Tip: Use 4 eggs if the eggs are extra large. Mix together all ingredients spread over French bread halves, dust with paprika. Broil until puffy and lightly brown. Cut into pieces and serve warm. Preheat oven to 400°. Cream together cheese and butter. Sift together remaining ingredients. Add sifted flour ingredients to cheese mixture, blend well. 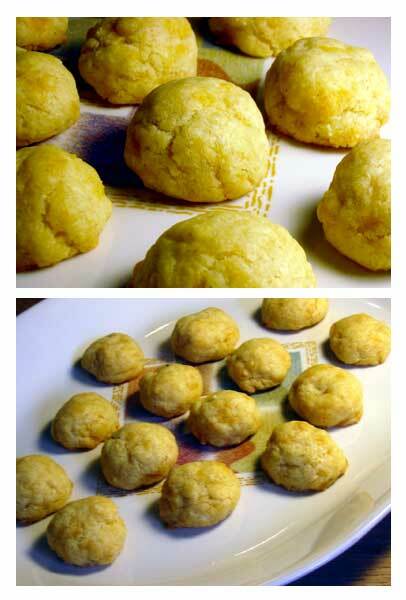 Pinch off pieces of dough, then roll to form approximately 3/4-inch diameter cheese balls. Chill for 2 hours. Place cheese balls on an un-greased cookie sheet. Bake about 10 minutes. Serve hot or cold. Yields about 24. Nana's Tip: Store cheese balls in an air tight container for use at your next party or celebration. Mix above ingredients, pour into a greased or oiled 9x13 pan. 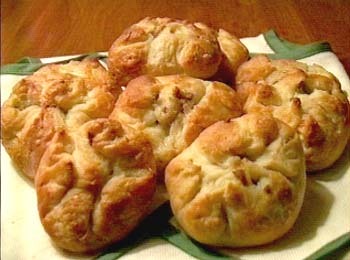 Bake for 30 minutes in a 350° oven or until firm and light brown. Allow to cool. Place into refrigerator over night. Before serving cut into bite size pieces, or larger size if used as a side dish. Thaw sausage if frozen. Use a food processor to chop sausage to a crumble mixture. In a large bowl, combine crumbled sausage, cheese and drained jalapeno peppers (add jalapeno peppers according to your taste). Separate each biscuit into 2 halves, making 20 separate pieces. Shape each piece into a square approximately 3" x 3". Put sausage mixture in each square, then pinch together like dumplings. Place on cookie sheet and bake according to biscuit directions. Serve warm or cold. 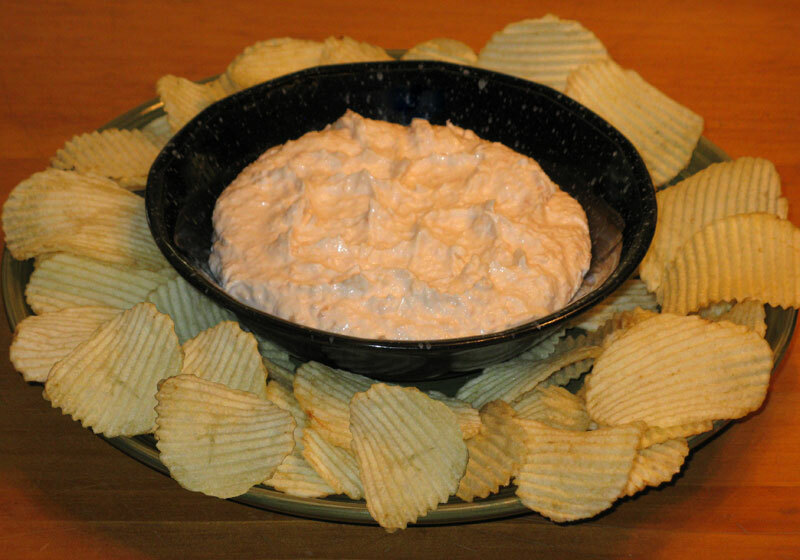 Nana's Tip: Can be served with dip consisting of 8 ounces of sour cream mixed with 1 package of taco seasoning. In a medium size bowl, beat mayonnaise and creamed cheese with electric hand beater until smooth. Add garlic powder and continue beating. Add well drained shrimp and continue beating until shrimp is broken into small pieces and mixture appears smooth. Additional mayonnaise can be added to allow chips to be dipped easily. Cover bowl with plastic wrap, place in refrigerator. Can be left in refrigerator for several hours or served immediately. Nana's Tip: I find the 1/3 less fat Ruffles tastier than the regular Ruffles. Recipe History: This recipe is a longtime regular at family gatherings -- most guests make a beeline to the dip upon arrival! This recipe has been skillfully prepared by Nana's Grandson, Steve Arnett...the tradition is certain to endure! In a large sauce pan warm condensed soup (do not add water to soup). Dissolve gelatin in 3 tablespoons of water. Add gelatin to soup and mix thoroughly. Add mayonnaise and cream cheese; stir until smooth. Add remaining ingredients and mix thoroughly. Place mixture in a bowl and refrigerate until firm. Allow the dip to sit overnight to thoroughly blend the flavors. 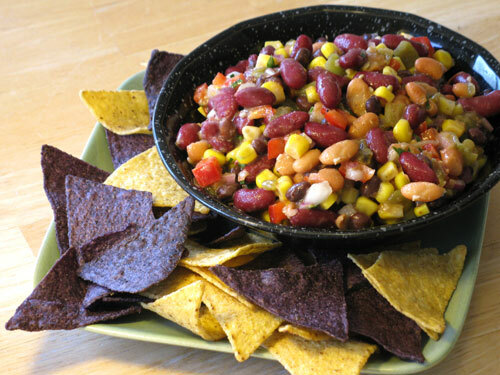 Serve chilled with dip chips, crackers or celery sticks. Nana's Tip: As a variation, try putting the dip in a mold before refrigerating. 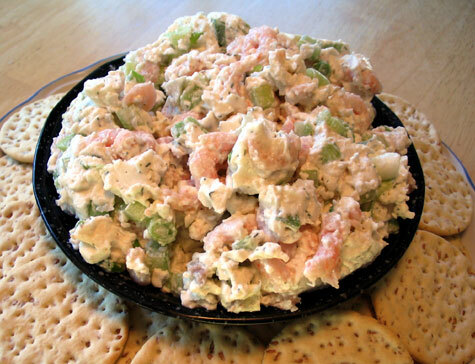 Nana's Note: The picture displays the recipe prepared with shrimp. In a 1 1/2 qt. casserole, place chopped stems and onion. Cover and microwave at high for 4 minutes, stirring after 2 minutes. Or, sauté onions and stems in butter until onions are tender. To the hot mixture above, add cream cheese. Mash and mix well. Stir in crumbs and chopped shrimp. Mound the mixture slightly over the mushroom in the cavity left by the removed stem. Divide mixture evenly among mushrooms. Arrange mushrooms in a circle on plate suitable for microwave oven. Microwave at high 3 to 4 minutes, rotating plate 1/2 turn after 2 minutes. If mushroom size is not uniform, smaller mushrooms may cook in a shorter time. If a conventional oven is used, bake at 350° for 18 to 20 minutes in a glass baking dish. To enhance the appearance, and brown the top of the mushrooms, place under the broiler. Watch carefully for a minute until slightly brown. 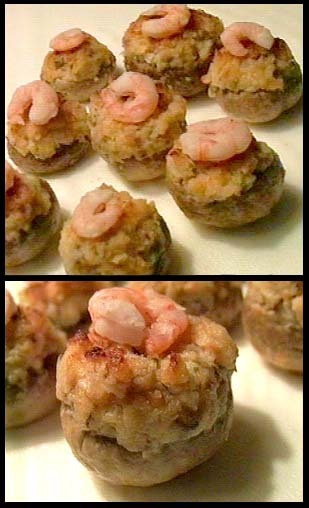 Garnish each mushroom with 1 whole shrimp after removing from oven or microwave. Nana's Tip: Select large or medium-sized firm, fresh mushrooms. When fresh, mushrooms are pale gray or white and the gills (the accordian-like vents on the underside of the caps) should be tightly closed and firmly attached. Mix above ingredients in a large bowl. Carve out center of round sourdough French Bread, leaving 1/2 inch thick edge. Tear or cut bread into bite size pieces and toast in a 350° oven until light brown. Fill bread bowl with spinach mixture allowing it to season at least 1 hour, before serving. Place filled bread bowl on a large round platter and arrange toasted bread pieces around the platter for dipping. Nana's Tip: Squeeze spinach by hand until all liquid is gone. In a small bowl, combine garlic, red wine vinegar and mustard. Let sit 5 minutes. Whisk in olive oil. Set aside. 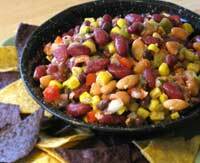 Place beans, corn, red pepper, onion and cilantro in a large bowl. Pour in vinegar mixture. Gently stir and season to taste. Refrigerate to allow flavors to blend.